Early investigations indicated the nature of the materials, but the significance of these was apparently not recognised in the planning, detailed investigation and design stages." A decision was made in April 1982 to restore the scheme and the remedial works cost NZ$17M. 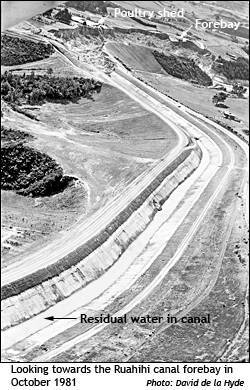 The canal failure zone was bypassed by a low pressure concrete penstock line, increasing the penstock length from 750m to 1850m, and a new forebay was built. Water hammer pressures had to be reduced, as the original concrete penstocks could only withstand limited overpressure. The turbine manufacturer beleived that the relief valve would limit the pressure rise to 3%, which proved true and negated the necessity to build a surge chamber. This would have been too heavy for the local ground conditions. The damaged area was landscaped, the scheme was recommissioned, and generation recommenced in June 1983. 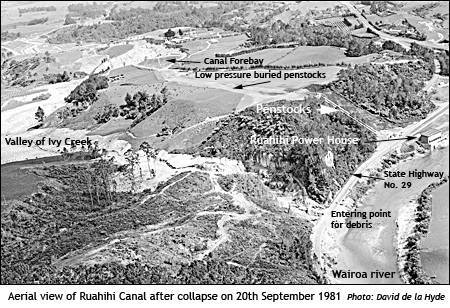 At approximately 1.50 p.m. on Sunday 20 September 1981, one day after Ruahihi Power Station had been officially opened, the eastern bank of the canal supplying water to the Ruahihi Power Station collapsed. 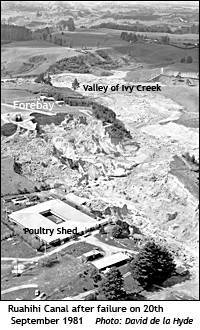 Up to one and a half million cubic metres of liquid mud and rubble descended down the valley of Ivy Creek, across State Highway 29, and into the Wairoa River. A 600-metre-long stretch of canal was destroyed, and a section of the highway was washed out. 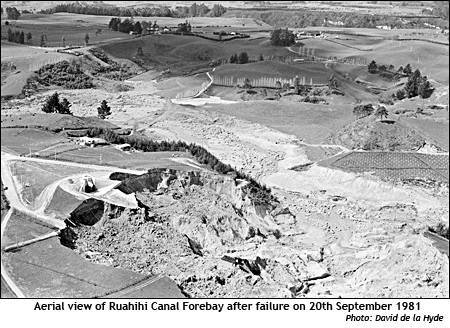 "Water losses from the canal, and a number of slope failures resulting from these, were observed soon after the canal was filled for the first time. Progressive slope failures on the embankment and slope immediately upstream of the forebay led eventually to a massive slope failure during which a chasm 500 m long, 100 m wide and 40 m deep was gouged out in about one hour. There was no loss of life and no-one was injured.